I’ve been having shortness of breath for several weeks, which we chalked up to the pneumonia, but it’s just gotten worse. Yesterday I had trouble just walking from one room to the next. Today, just sitting on the couch with a friend. In fact, I’m still having trouble, even though I’ve been hooked up to the oxygen all day. We’re going to the ER now, to get scans, at the direction of my oncologist. Please pray for us tonight. After spilling my heart out to you on Wednesday and tossing and turning for hours, I finally fell into sleep, only to be awakened by my little one and his fears (the scary trees outside his window) at 4 a.m. A few hours later, my hubs woke me up in the boys’ room, where I’d accidentally fallen back to sleep while comforting Little Bear, and we headed down to the hospital for my chemo infusion. We don’t tell the kids exactly where we go when we go to the hospital these days. They know we go for an appointment, and they know I’m ill, and that’s enough for them right now. Better we get them settled into school and deal with normal little-kid fears and transitions for now, and work the cancer stuff around their comfort with the new-teacher, new-friends shuffle first. After my name is called at the cancer center, I’m ushered back to sit in the oversized chemo chairs, one per curtained area, each paired with a small, uncomfortable chair, where the patient’s support person can perch as she or he holds the patient’s hand. The other hand is held still by the chemo nurse’s elbow while she punctures the vein — or vein after vein, as she tries to get a good stick, where the IV slides nicely into the patient’s vein and stays there, ready to deliver the chemo. I’ve had some horrible times in that chair over the years. Nurses have missed my vein, popped my veins, rolled my veins, and all kinds of ugly during the 6 months of chemo I had in 2007 and monthly or quarterly lab draws and tests since then. The chemo I need now, however (Navelbine every 2 out of 3 weeks and Zometa every 3 or 4 weeks) doesn’t go through an IV. I needed a port. I have a port now, and I mentioned it before, but I don’t think I showed it to you. 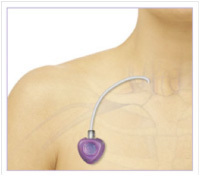 Here’s what a medi-port or a port-a-cath looks like, in cartoon version, unfortunately, but if you’re strong of stomach, you can always google image search port-a-cath and see one planted in many different patients and survivors. There are many strong smiles out there, and it’s actually rather impressive to see so many strong women and men (and children) voluntarily getting this port for chemo and its nasty side effects, all in effort to live a little longer. It reminds me that I’m just one of so, so many cancer patients today. 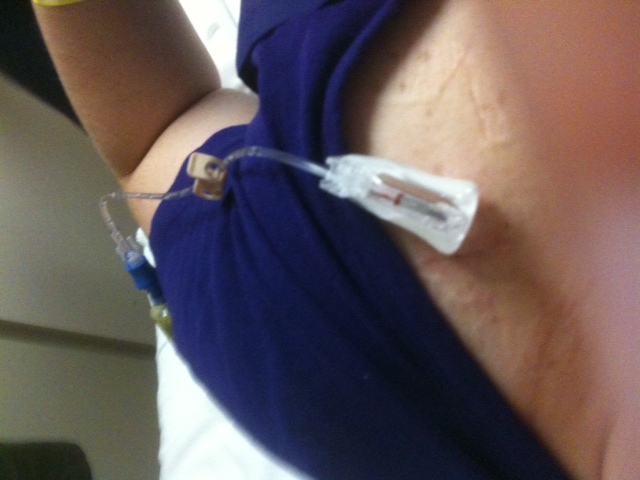 So I have a port now, and on chemo days the nurse gloves up, wipes the bump on my chest clean, and pushes a device into me that will attach the tubes outside my body to the tube inside my body that winds from the port to the jugular vein in my neck. There’s a cut on my neck from the surgery, and I hope it heals soon, because with most shirts the port and tube itself aren’t at all visible. Because the cancer is in my spine now and I’m so uncomfortable, when there’s space, I sometimes rank a bed in the chemo unit, which is nice, because it’s quiet and I can get my morning sleep in while I wait for the lab results and everything else to come back – once they come back normal (or normal-ish), then the order goes into the pharmacy and they begin to mix the chemo. It takes another hour and a half after that before the infusion starts. But my cancer center is a good one, and well-funded, and we each now have a small flat-screen tv and cable to entertain us with, as well as a decent wi-fi signal. It’s a pleasant place to get chemo, and I don’t mind it nearly as much as I used to. But it does make me tired. I’m not sure where today’s post was going, really, but I wanted to show you the picture of my port-a-cath and needle assembly, because it freaked me out a LOT at first, but now it’s just a part of me, and I’m learning to get used to it. Just please, don’t hug me too close on my left side for a while – there’s a new bump there, and it’s tender. Oh, I remember now! The new bit of hope. When we met with my oncologist yesterday, it was the first I’d seen her since my hospital visit, and I was pretty groggy then as they fed me all that pain medication. We talked the situation through again, and we have some new hope. First, we added the Zometa infusion back to my treatment regimen, and this will help to build my bones. It wasn’t a failure earlier this year; Zometa doesn’t help keep the cancer from growing at all. What it does is strengthen the bones so that the effects of the cancer cells in the bones are lessened. We’ll keep doing that, and hopefully it will work and my bones will get stronger. Second, we made a medication change to help me with some side effects. And third, when we asked her about the overwhelming fatigue, the tiredness that is impossible to overcome, and the exhaustion that sends me back to bed every three hours, she was able to help, and to give me some hope. The fatigue may not be from the cancer destroying my bones. The fatigue may be a side effect of the medications. Both infusions have heavy fatigue as a side effect, as do both of my pain relieving medicines (opiates), and another pill that I take for anxiety and hot flashes, side effects of (very) early menopause. The combination is almost a guarantee that I’ll be tired, but no one expected me to be this tired! So I’m to rest when I need to (which is still a lot), but next week I’ll start a sixth medication that will counteract this side effect of the first five. I’m not anxious to add medication, since I’d be an all-natural organic girl if I could, but at this point my body chemistry is anything but natural, and that is what is keeping me alive. So, a sixth medication it is, and I can’t wait to be able to be awake for a whole afternoon! To think that I may be able to reclaim an afternoon without sleep? That would make everything more possible. Walking into a conference for planetary science and new mission planning yesterday, I got in line to pick up my badge. I hadn’t been there five minutes when I was greeted by an old colleague who, instead of shaking my hand, smiled and said, “Well, I see you’ve been busy!” and patted my stomach several times in quick succession. I stared blankly at him, honestly not getting it (I’m mostly with friends these days). So he did it again. I smiled weakly, realizing that he thought I was pregnant because of my treatment-swollen belly (I’ve been on drugs and chemotherapy with nasty side effects this year, the least of which are a) weight gain and b) the inability to lose weight). I do my best to camoflauge it with clothing, but since I have no breasts (double mastectomy in 2008 to save my life), it’s difficult, particularly when I’m swollen with lymphedema too. It was not the best of ways to start a conference. the oncologist agreed. we can stop the chemo. the balance of possible eradication of stray cancer cells versus quality of life has tipped severely now, and she agrees that it’s not worth it. There are no studies, anyway, that show that 6 cycles (18 weeks) of Xeloda post-surgery and radiation are more effective than 4 (12 weeks), or even what the suggested treatment regime should be. We struggled with this in March, again in August, and once again today. This treatment was all a best effort kind of thing, a hope that after the surgery removed the thirteen swollen cancerous nodes that the chemo would scrub my blood and organs clean, killing the escaped cancerous cells before they could swarm and divide and form new tumors. This was our best effort (particularly since the other drug, Avastin, failed to win FDA approval in September), and we have given it our best shot. No, more than that. We have completed 5 cycles (15 weeks) of ups and downs, ins and outs, nausea, vomiting, stomach cramping, throat sores, fatigue, napping, exhaustion, foot sores, tenderness, and peeling, slippered preschool pickup, isolation, loneliness, chocolate cravings (week 3), loss of appetite (week 2), inability to eat meat, warm food, shredded wheat or crackers (all weeks), constipation (week 1), diarrhea (week 3), and a general occasional bitchiness that I blame on the fatigue and pain. Oh yeah, the pain. Somewhere last week I twisted my upper back again and today was simply impossible. After trying to sleep the pain off yesterday, I woke today in so much hurt that I couldn’t concentrate on a short talk with my husband. I broke down and admitted the pain, high in my spine, that I had been trying to hide, and he helped me call the doctor and choose a pain pill, and then he tucked me into bed with a cold pack. I was no better hours later, crying that I couldn’t see through the pain, and we upped my dose and made a plan to talk to the oncologist about it today. Long story short, the resident ran some neuro tests, we talked about my history, and he and my oncologist recommended that we stop the chemo and give my body a chance to heal. It’s been under a lot of physical stress this year (9 months since the tremors that signaled a change), and it needs a break before we can start the endocrine therapy again. Her directions were: Stop the chemo. Rest. Relax. De-stress. Give yourself a break. After the holidays, we’ll focus on eating right, beginning again to exercise, and start the Aromasin again, to deprive any remaining cells of the estrogen they feed on. But for now, de-stress. Give your body a chance to recover, so it can withstand the Aromasin again and start to exercise and grow strong again soon. Those were the words she said, but all I could hear was their impact: I can spend Christmas with my boys, and hopefully have enough strength to celebrate. I celebrated with the last of the cupcakes and tucked myself back into bed when we got home. and we all snuggled, watching Tom and Jerry discover silly green aliens on Mars while we waited for my body to react to the chemo pills. This morning’s routine was not nearly as much of a ritual, squeezed in between showers and timed after breakfast and before we got distracted by the children’s needs. So far, so good. I’m not reacting violently to the xeloda, which is fantastic. My oncologist says that we’ll know how I respond after a week, in terms of side effects, and after three weeks, in terms of white blood counts (that fight infection) and liver counts (which can be damaged by the treatment). So today I rest, and watch, and pick blackberries from the garden with the children. My body now has the tools to fight the cancer. Six pills down, 498 to go. I’m over at Workout Mommy’s place today — if you’d like a guest post on IBC for your blog, drop me a line and I’ll write one just for you too (or you can cut-and-paste the one below. It’s yours, no problem, just please link back to me and let me know you did). 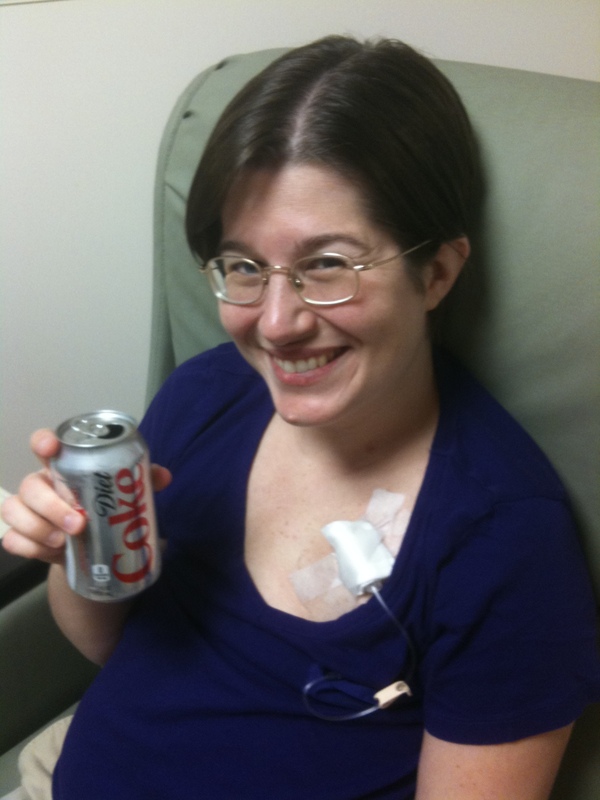 It’s still important to get the word out — as much as I’d like to move on and forget about it, it’s not like people have STOPPED getting IBC since I finished my treatment. In fact, an estimated 25,000 women have been diagnosed with IBC since I was diagnosed in June 2007, and many have died because they weren’t diagnosed before it had spread too far. Let’s keep spreading the word — there’s more than one kind of breast cancer, and inflammatory breast cancer is the cancer without a lump. There’s more than one kind of breast cancer. Did you know that? During October, we’re so often flooded with “buy pink” campaigns, and reminders to check ourselves for lumps, that it’s become almost commonplace. We all know that we should do regular self exams, and we’ve heard it so often that the urgency often fades into the background of children, spouses, laundry, and work. But did you know that there’s a kind of breast cancer that forms without a tell-tale lump? It’s called inflammatory breast cancer, and it spreads FAST. The cancer forms in thin sheets, or in nests, like a bird’s nest of cancer growing inside your breast. There are few external signals or symptoms, and they’re sneaky too, since most of them are similar to mastitis, which many of us have experienced while breastfeeding a baby, or bug bites, or sunburn. But taken together, one or more of these symptoms can signal a dangerous cancer lurking in your breast. There’s a great illustration of these symptoms over at Worldwide Breast Cancer that is guaranteed to be not like anything you’ve seen before…. In my mind, it boils down to this. If you notice ANYTHING DIFFERENT on one breast that’s not on the other breast, please CALL YOUR DOCTOR. Today. Because this cancer moves fast, faster than almost any other cancer, and is deadly. Only 40% of patients survive 5 years after diagnosis. In the 2.5 years since my diagnosis, I’ve already lost a dozen friends to cancer. Many of them were moms and bloggers, readers just like you. They fought hard. They fought with everything they had. But cancer treatment is largely still in the experimental stages, and it’s a tough road. Just to be here today, I had to not only survive cancer, but also survive 6 months of chemotherapy, 7 weeks of daily radiation, 2 surgeries to remove my breasts and ovaries, and a lot of physical therapy to deal with lymphedema, which makes my arm swell in the heat when I step outside (as a lovely side effect of the mastectomy that took all my lymph nodes on that side). It’s been a hard, hard road, but I’m grateful for the chance to be here today, to hug my children, to play their games, to laugh at their knock-knock jokes. There is joy after cancer. But first we have to get there. So please, take a moment, call/email/blog/tweet/update your friends, and SHARE the SIGNS of inflammatory breast cancer with the people you care about. You never know. You might just save a life. You are currently browsing the archives for the chemotherapy category.